Dave clicked the button on the keys and the car’s lights flashed. Suddenly, something bright materialized on the asphalt paving just beneath the two doors. Neither Dave nor I is particularly a car person; basically, we just want to get where we’re going. For twenty-five years of commuting, Dave has depended upon a rotating fleet of dependable, used Volvo “beach wagons,” as he calls them. Those cars have been tanks, solid and safe. Two years ago, I tearfully gave up my aging used Caravan after eleven years of faithful service. Her replacement, my little Ford C-Max, has proved a worthy friend, chugging her way up snowy hills and easing me over icy roads during this long Connecticut winter. 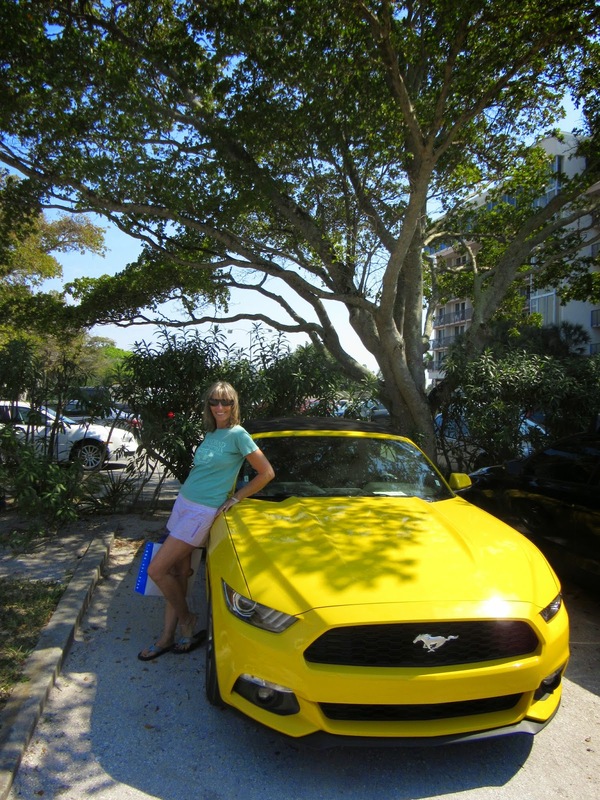 For this spring’s Florida trip, however, the car-of-the-week sale model, cheaper than the Neons and Elantras which have transported us in the past, happened to be a bright yellow Mustang convertible. “Like Bumblebee, the Transformer,” I noted. An association that meant little to Dave, but for me, gave the car personality and the potential for unexpected powers. But a yellow car? As a rule, I’m not a fan. Convertibles? Make me nervous. “I’ll want a helmet,” I’d said to Dave when first he mentioned this possibility, my disappointing caution immediately dousing his boyish expression of glee. But when the car glided to a stop in front of us at the Alamo tent in the parking lot outside Sarasota Airport, we turned to each other and grinned. Oh yeah. I did not mention to Dave that I have a history with Mustangs. In 1971, at 18, I was a late bloomer, and my first real boyfriend, Chip, invited me to go camping with him in Maine. My mother was leery about the idea and I received several lectures on separate sleeping bags prior to my departure. I was a little leery about the whole thing myself, to be honest, although I was not going to admit that to Mom. I’d never gone camping. Never spent an extended period of time with a boy. Never climbed a mountain. Never eaten freeze-dried food. Chip had sent me a list of provisions to acquire, and as I stuffed my new backpack with thin foil containers of beef stroganoff and chicken a la king, my mind churned with misgivings. I remember only bits and snatches of that excursion: a lobster dinner by Lake Sebago, my exhaustion in climbing and hauling that pack, Chip’s humor and kind patience in encouraging the wilting flower his girlfriend turned out to be, the separate sleeping bags…and for a good part of the trip home, I drove his white Mustang. Now, forty-four years later, I sit writing on a balcony above a palm tree–lined boulevard. Across the street, an expansive white sand beach stretches along the shore of the Gulf’s blue waters. My feet are propped on the wrought iron railing, my toenails freshly painted a tarty Goth eggplant/black shade. It is so me. Well, not really, but after a winter of snow, heavy clothes, and colorless toes, this brazen hue, the spring’s first polish, is as symbolic as shedding my wool coat. Vacation-Lea has returned, and she’s so much more fun. To my mind, a key element of a good get-away is car-avoidance. 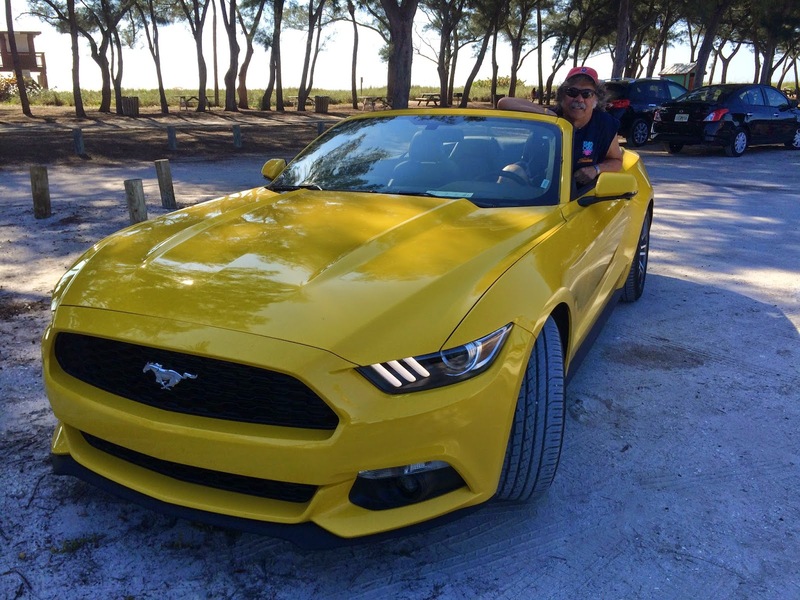 A yellow Mustang convertible has not changed that. An hour or so ago, when stomach rumbles prompted thoughts of lunch, I suggested a stroll to Tommy Bahamas, just around the corner. But Dave had a hankering for tuna mixed with capers, celery, and mayo. Seriously? “But Honey, that would mean a trip to the grocery store,” I noted with a hint of a whine. “You want to drive the Mustang,” I said. And there he is! Just now! Passing beneath the balcony! The car’s top is down, and it’s brilliant yellow color is a gleaming statement of bold cheer. With repeated, lasting, lusty honks; a smile I can see and feel from several floors up; and an arm upraised in a gesture that’s a salute as much as a wave, Vacation-Dave cruises by.